This dataset provides several estimates of aboveground biomass from various regressions and allometries for mangrove forest in the Zambezi River Delta, Mozambique. Plot level estimates of aboveground biomass are based on extensive tree biophysical measurements from field campaigns conducted in September and October of 2012 and 2013. Aboveground biomass estimates for the larger area of mangrove coverage within the delta are based on (1) the plot level data and (2) canopy structure data derived from airborne LiDAR surveys in 2014. The high-resolution canopy height model for the delta region derived from the airborne LiDAR data is also included. This dataset contains seven data files in GeoTIFF format (.tif) and one file in comma-delimited text (.csv) format. This dataset provides several estimates of aboveground biomass (AGB) from various regressions and allometries for mangrove forest in the Zambezi River Delta, Mozambique. Plot level estimates of AGB are based on extensive tree biophysical measurements from field campaigns conducted in September and October of 2012 and 2013. AGB estimates for the larger area of mangrove coverage within the delta are based on (1) the plot level data and (2) canopy structure data derived from airborne LiDAR surveys in 2014. The high-resolution canopy height model for the delta region derived from the airborne LiDAR data is also included. There are seven data files in GeoTIFF format (.tif) -- six files of LiDAR-derived biomass estimates and one with the canopy height model (CHM) generated from airborne LiDAR data collected in May 2014 (Fatoyinbo et al., in review). There is one comma-delimited file (.csv) with selected field plot biomass metrics and estimates collected during field campaigns in September and October of 2012 and 2013 (Stringer et al. 2015, Trettin et al. 2015). ***The dataset authors advise that the Njana Power-based AGB map (njana_power_agb.tif) provides the most accurate estimates of AGB for this region as it is based on an allometric equation specific to East African mangrove forest, takes into account tree height, and has the highest range of input diameter at breast height and height measurements. The CSV data file (zambezi_plots_height_biomass_metrics.csv) provides measurements of field H100, Lorey's height (LH; see Section 5), LiDAR H100 (2014), and AGB derived from the three allometries for plots that fall within the airborne survey coverage. Columns names, units, and descriptions are given in Table 2. This dataset provides aboveground biomass estimates of tall mangrove forests in the Zambezi Delta, Mozambique. Mangroves are ecologically and economically important forested wetlands with the highest carbon density of all terrestrial ecosystems. Because of their large carbon stocks and importance as a coastal buffer, their protection and restoration has been proposed as effective mitigation strategy for climate change and coastline loss. Comparison of field and LiDAR height metrics showed that the airborne survey data was highly correlated with field estimates of forest canopy height at the plot level across the entire range of sampled canopy heights. The strongest correlation between field and airborne survey metrics were found between LiDAR H100, LH, and Field H100, with 93% accuracy prediction between the airborne and field survey metrics. The root mean square error for the LiDAR H100 and Field H100 comparison was of 1.7 m and 1.4 m for the LiDAR H100 versus the LH comparison. A summary of the LiDAR-based AGB predictive models equations and their respective correlation coefficients can be found in Table 3. In general, the LiDAR-based regression models performed equally or better in estimating AGB as the field height measurements in terms of R2. Table 3. Regressions models based on AGB and LiDAR H100. Field sampling was conducted over two seasons in September and October of 2012 and 2013. 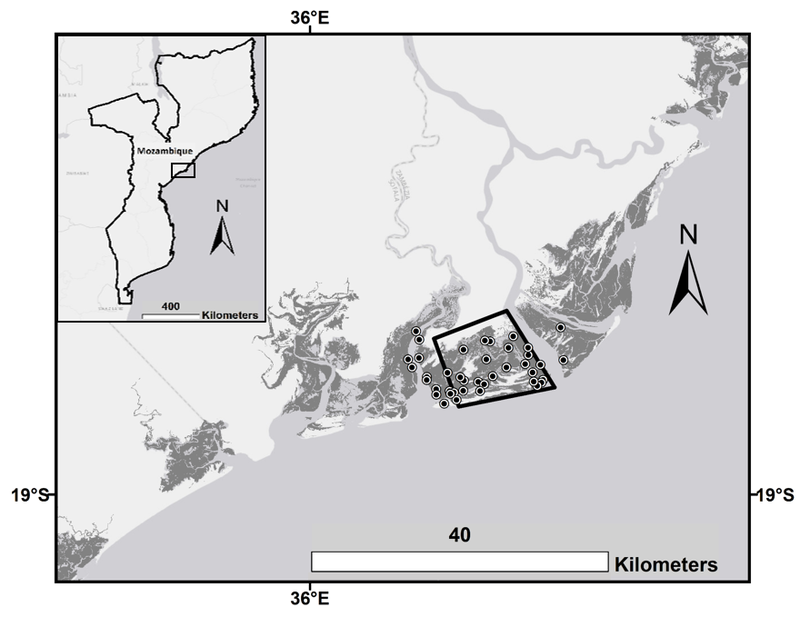 Field-based canopy height and carbon stock estimates were inventoried using a stratified random sampling design that took into account forest canopy height classes determined from the Mozambique mangrove canopy height data product derived from SRTM and GLAS data (Fatoyinbo et al., 2008). The forest was separated into 5 height classes and five sub-plots were used as the basis for measurements and sampling within each 0.52 ha plot to characterize above and belowground biomass carbon pools. Field H100 and A nested sampling approach was used to measure tree diameter at breast height (DBH) and height within each subplot, with trees > 5 cm measured on the entire sub-plot and trees < 5 cm measured on a 2-m radius area. Field H100 height and Lorey's mean weighted height (LH) were calculated within each plot as a basis for comparison with the LiDAR height measurements used to generate biomass estimates. H100 represents the height of the 100 tallest trees in a given hectare. Field H100 was calculated from the field data using the average of the two tallest trees for each sub-plot. where hi is the height in meters for each tree and gi is the basal area in square meters for each tree. The H100 and LH measurements are provided for each plot in the CSV data file (zambezi_plots_height_biomass_metrics.csv). Additional details regarding the mangrove field inventory can be found in Stringer et al. (2015) and Trettin et al. (2015). Field plot locations are depicted in Figure 2. To compare, enhance, and validate spaceborne-based assessments, airborne LiDAR data were acquired 5 May 2014 by Land Resources International (Pietermaritzburg, South Africa). The airborne survey comprised an approximate area of 115 km2 in the Zambezi Delta region, Mozambique, with a point density that ranged between 5 - 7 points per m2 (Lagomasino et al., 2016). The LiDAR data were used to generate the high resolution (1m) CHM included in this dataset. The LiDAR data files are available as a related dataset listed above in the Dataset Overview section. Total aboveground biomass (AGB) was estimated using the generalized Komiyama et al. (2005) mangrove allometry, the pantropical Chave et al. (2005) allometry, and the site-specific Njana et al. (2015) allometry derived for Tanzania as there is no site-specific published allometry for the Zambezi region. where AGBK is above-ground biomass in kg per tree, ρ is wood density in g*cm-3 and D is DBH in cm. This equation has a standard AGB error of 8.5% and was generated for mangrove stands with a measured DBH up to 49 cm (Komiyama et al., 2005). The Chave et al. 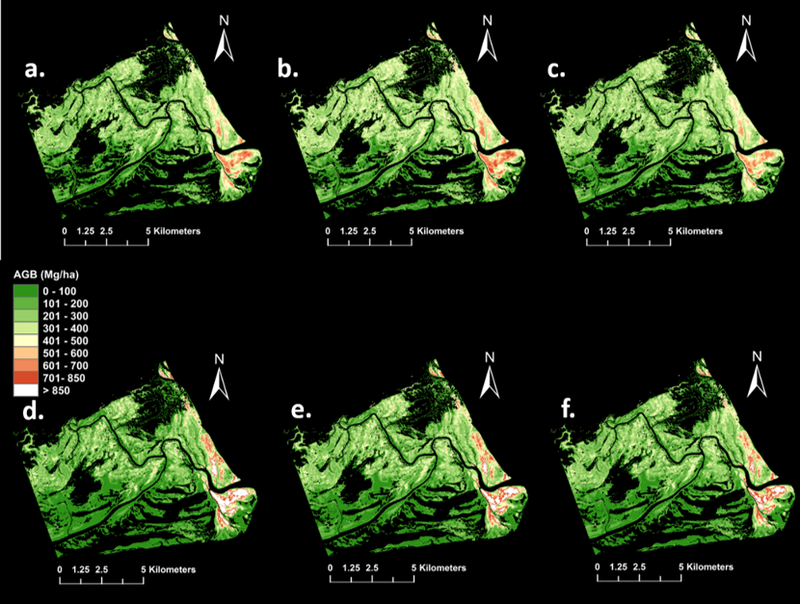 (2005) allometry reduces the standard error (12.5%) by incorporating tree height information and was generated for mangrove stands up to 42 cm DBH. This model was developed for quantification of tree AGB and BGB for Avicennia marina, Sonneratia alba, and Rhizophora mucronata, which are dominant mangrove species in East Africa. The standard error for this equation was less than 10%, with a range of DBH up to 70.5 cm, and maximum height of 32.2 m.
The dataset authors advise that the Njana Power-based AGB map (njana_power_agb.tif) provides the most accurate estimates of AGB for this region as it is based on an allometric equation specific to East African mangrove forest, takes into account tree height, and has the highest range of input diameter at breast height and height measurements. Fatoyinbo, T.E., E.A. Feliciano, D. Lagomasino, S.K. Lee, C. Trettin. Estimating mangrove aboveground biomass from airborne LiDAR data: A case study from the Zambezi River Delta. Environmental Research Letters. In Review.